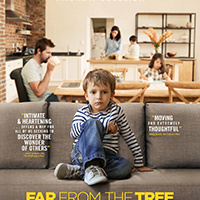 Showing on Monday-Saturday, Jan. 28 - Feb. 2, “Far From the Tree” follows families in which parents and children profoundly differ in a variety of ways. The documentary is based on Andrew Solomon’s New York Times best-selling book “Far From the Tree: Parents, Children and the Search for Identity” and offers a look at how families are meeting extraordinary challenges through love, empathy and understanding. The Huffington Post said that “the film shines a bright light not just on these different families: It also portrays a more universal vision and offers a map for all of us seeking to discover the wonder of others.” The film is not rated.